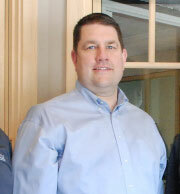 Heinsohn, an educator by training, entered the window business in 2006 as the Operations Manager for Salem Millwork, a specialty window and door company that closed in 2008. As a former teacher and coach, he values the importance of education and building partnerships within the industry and certainly with each new customer. The individual attention he gave to each student is the same approach he uses with each client. Heinsohn has worked with commercial contractors, residential custom home builders and remodelers as well as directly with homeowners. He has lived in Winston-Salem for 15 years, is married to a native North Carolinian, and has two young children. Heinsohn is active with Knollwood Baptist Church where he serves as a deacon and sings in the choir. When not working, he can be found in the kitchen cooking, playing in the yard with his kids or staring longingly at the bicycle he used to ride before he had kids. Chris is a seasoned professional millwork sales representative and valuable team member who has been involved on both sides of the construction business. Early in his career, Chris was a trim carpenter who eventually transitioned into retail where he trained other sales representatives regarding window and door products. Chris spent the past 25 years selling high quality fenestration products, especially Marvin and Integrity products. Chris’ experience and knowledge easily translates to homeowners or building professionals, helping them understand and feel comfortable with their window and door choices, which tend to be one of the most expensive parts of major home renovations. Knowing that Chris is taking meticulous time and effort to ensure every detail is done right keeps customers coming back to him. Chris has lived in NC for 35 years, and is married to a NC public school teacher. They have one adult son. When not working, Chris can be found in his wood working shop, brewing his next batch of beer, or tending to his garden. Chris joined our team in 2016 and coordinates deliveries and our warehouse logistics. A US Marine Corps veteran, Chris served during the Gulf War and learned to drive trucks, tanks and other machinery while serving in the armed forces. Prior to joining SW&D, Chris worked in the delivery department of Habitat for Humanity of Forsyth County’s Re-Store. Chris has two young children. When not working, he can be found writing and recording R&B music. Jason Glover is owner of Summit Installs, one of our installation partners. Jason has performed work on large commercial projects and residential remodels and replacement windows. Jason keeps informed with factory training courses offered by the manufacturers on the best practices for window and door replacements, as well as more intricate installations on scenic doors like multi-slides and bi-fold door configurations. He and his company are valuable assets to our team; they are devoted to keeping the high standards of quality and customer service we depend upon.